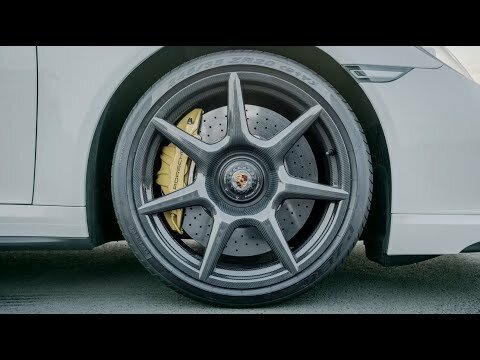 Porsche introduces the technologically advanced wheels with braided carbon fiber. These will be initially available on the 911 Turbo S Exclusive Series. Being the first car manufacturer to offer such innovation, the wheels will come with a massive sticker price of 15,232 Euros (or $17,970 after the current exchange rates). Braided carbon wheels are made from CFRP (carbon fiber reinforced polymer) which is an extremely lightweight material that’s optimized absolutely for the absorption of longitudinal and lateral forces. It is also said to be 20% lighter and 20% stronger than regular alloy wheels. Besides trailing the road more efficiently due to lesser unsprung weight, the lower rotating masses would also mean spontaneous braking and acceleration. These would all result to more pleasurable driving plus better driving dynamics. Porsche uses its massive carbon fiber braiding machine that has a measurement of 9 meters in diameter to cut and assemble more than 200 individual parts of the wheel. After the assembly, the wheel is pre-impregnated with a certain type of resin and baked using high levels of pressure and temperature. This is followed by an extensive cooling process before the finished wheel that will be inserted with a central lock and painted with lacquer as protective coating. Be that as it may, the intricate paint procedure involves painting the rim and spokes first with gold before painting the entire surface with black. The next procedure entails the use of a programmable laser machine which is set to an exact level of intensity to burn down the black layer resulting to a more intense shade of gold. Since the technique they use also allows the carbon material’s structure to be more compact and significantly denser, Porsche’s highly sophisticated technology provides more benefits over the more traditional procedure of manufacturing pre-impregnated carbon fiber. There are in fact 8 sq. meters of carbon fiber fabric for each fancy Porsche wheel. For a hefty amount of 17,970 USD, we wonder how Porsche’s braided carbon fiber technology would measure up with all the carbon fiber wheels out now in the market. There seems to be a growing interest on carbon fiber wheels following Ford’s partnership with Australia’s Carbon Revolution. As for Ford, they will be offering the limited series production wheels for the new GT and the GT350 R. Then there is also Koenigsegg’s hollow carbon fiber Aircore wheels. Porsche’s braided carbon fiber wheels will be optionally available only on the 911 Turbo S Exclusive Series and should come out by early next year. The automaker will be offering it with 9x20 in diameter (front) and 11.5x20 in diameter (rear). Porsche has become the world’s first vehicle manufacturer to offer lightweight wheels with braided carbon fibre. They are available now as an option for the Porsche 911 Turbo S Exclusive Series. Carbon, the characteristically black high-tech material, can be fully appreciated with a protective layer of clear lacquer. Together, the innovative wheels weigh around 8.5 kilograms less than standard alloy wheels, which is a reduction of 20 per cent. They are also 20 per cent stronger. With a reduced unsprung weight, the tyres trail the surface of the road better and are perfectly optimised for absorbing longitudinal and lateral forces. Lower rotating masses mean more spontaneity both in acceleration and braking. The result is increased driving dynamics and driving pleasure. Manufactured entirely from carbon fibre reinforced polymer (CFRP), the wheel is essentially comprised of two components. The wheel centre is made from carbon-fibre fabric. This involves cutting and assembling over 200 individual components. The second component is the rim base made from braided carbon fibre by what is currently the world’s largest carbon fibre braiding machine with a diameter of approximately nine metres. The wheel centre is then braided into the rim base. The assembled wheel is impregnated with resin and pre-hardened at high pressure and high temperatures. The finished wheel is hardened at high temperatures followed by a long cooling process. The central lock is then inserted into the finished wheel and the wheel is protected with clear lacquer. Porsche is the first company in the global automotive industry to use this extremely complex technology. The braiding technology offers key advantages over the more conventional method of manufacturing pre-impregnated carbon-fibre fabric: This production technique makes the material structure of the carbon considerably denser and more compact. This increases rigidity. Using the material more efficiently also produces less waste. The new carbon wheel is made from a total of 18 kilometres carbon fibre or eight square metres of carbon-fibre fabric. From the beginning of 2018, the new carbon wheels will be available as an option for the 911 Turbo S Exclusive Series in the dimensions of 9 J x 20 for the front axle and 11.5 J x 20 for the rear axle. In Germany, the price will be EUR 15,232 including VAT.